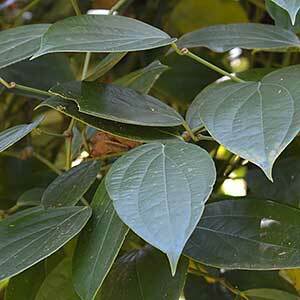 The Plant that produces peppercorns used for cooking is Piper nigrum and this is a vine rather than a tree. It is best grown as a tropical plant. It likes a cool root run and a humid warm climate. It is originally from the tropical areas of Southern India and requires a similar climate to thrive. Plants take a number of years to mature and it is the green peppercorns that are harvested to dry and make black pepper. The green peppercorns are also harvested and pickled to make ‘green peppercorns’ . If they are allowed to ripen and turn red then the seeds inside turn white and we have white pepper. The reverse of the leaves is often covered with small black beads, this is the result of a sugary secretion which is a natural process. These plants do need a tropical climate to grow well. Position – Dappled shade to full sun. Climate – Tropical to sub tropical. Plant Habit – Climbing Vine. Foliage – Green and heart shaped. Flowering period – In good conditions Piper nigrum will flower and fruit almost year found. Fruits – Green turning to red ( picked when red. You can grow Piper nigrum in a container indoors if you wish. It is an attractive indoor plant as long as it is a warm position and with good filtered light. Fertilise with a slow release balanced fertiliser every 4 – 6 weeks. Less fertiliser in cooler months. Do not over water and do not over pot. Allow the soil to dry partially between waterings.